A BEAUTIFULLY PRESENTED EXTENDED SEMI DETACHED FAMILY HOME AVAILABLE WITH NO UPPER CHAIN comprising. Entrance hall. Sitting room. Dining room. LUXURY REFITTED KITCHEN. UTILITY ROOM. CLOAKROOM. Master bedroom with BALCONY and ENSUITE. Two further bedrooms. LUXURY REFITTED BATHROOM. LARGE GARDENS. GARAGE and recently laid block paved driveway providing off road parking for several vehicles. Double glazed UPVC front door set below canopy storm porch. With stairs to the first floor. Under stairs storage cupboard. Radiator. Thermostat control. Part glazed door opens to the sitting room with double glazed window to the front with integrated blinds. Solid wood flooring. Feature fireplace and surround with inset gas fire. Radiator. Television point. Coving to the ceiling. Part glazed door opens to the dining room. Twin double glazed doors and side panels to the rear garden. Radiator. Tiled flooring. A luxury fitted kitchen boasting a range of base and eye level storage units. integrated fridge and freezer. Built in double oven. four ring gas hob with canopy extractor hood over. Ample work surface areas with inset one and a half bowl sink unit with mixer tap set below double glazed window with integrated blinds overlooking the rear garden. Plumbing for dishwasher. Vaulted ceiling with recessed spot lighting and Velux window. Tiled surrounds and flooring. Radiator. With a range of base and eye level storage units. Work surface areas with inset sink with mixer tap. Plumbing for washing machine. Vent for tumble dryer. Space for fridge freezer. Tiled surrounds and flooring. Wall mounted gas fired combination boiler serving central heating and hot water. Double glazed window to the side. UPVC double glazed door to the side. A white suite comprising low level wc. Wash hand basin with mixer tap. Tiled splash backs and flooring. Radiator. Extractor fan. Stairs rise to the first floor landing. 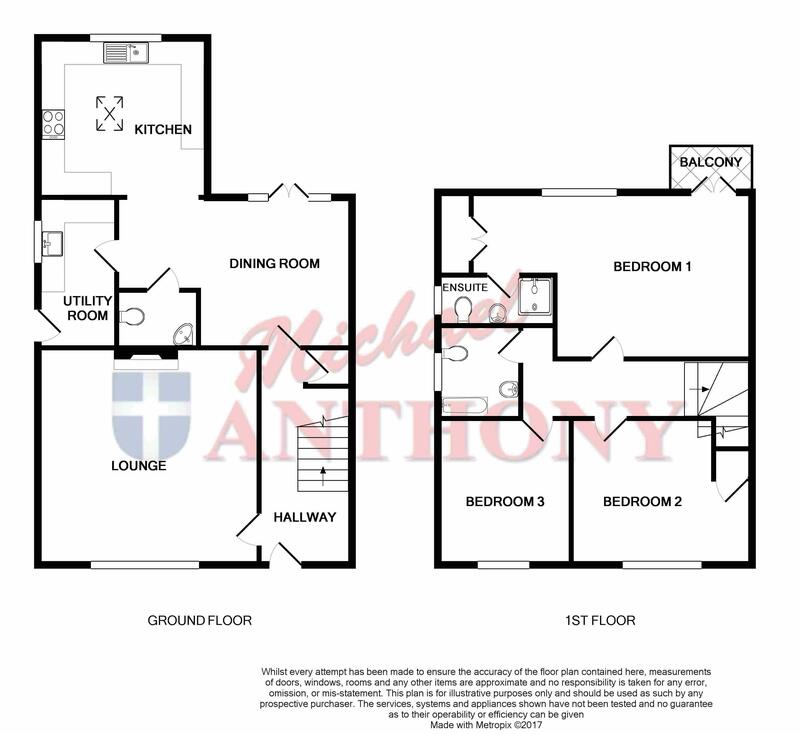 With twin double glazed doors and side panels opening to the balcony with far reaching views. Radiator. With built in wardrobes. Double glazed window to the rear. Door to ensuite. A luxury three piece suite comprising. Low level wc and wash hand basin housed in vanity unit and surround with storage cupboard below. Double shower cubicle with power shower. Tiled surrounds. Heated towel rail. Extractor fan. Recessed spot lighting. Double glazed window to the side. Double glazed window to the front. Radiator. Built in storage cupboard with access to the insulated loft space. A luxury white, refitted three piece suite comprising. Low level wc. wash hand basin. Shaped bath with central mixer tap. Power shower over. Tiled surrounds and flooring. Heated towel rail. Extractor fan. Double glazed window to the side. Situated alongside the property with driveway approach. power and lighting. Courtesy door to the rear. An undoubted feature of the property is the established rear garden. Extending to over 80 feet in depth with a sunny westerly facing aspect. With a paved area to the immediate rear and further patio for outside dinning. The gardens are mainly laid to lawn with inset established flower beds. Screened by paved fencing and bushes. Outside tap. Gated side access. Brick built storage shed with Power and lighting.